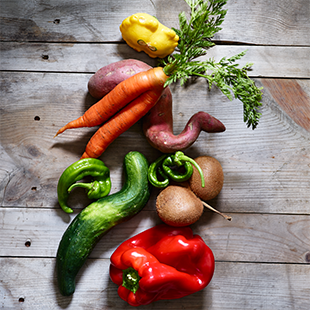 The ugly food movement is taking off—jump on board to help reduce food waste. Imagine if having freckles or curly hair meant you were banished from society. That’s basically what’s happening in the produce aisle. One unsightly blemish or extra curve, and otherwise top-notch fruits and vegetables don’t make it onto dinner plates. While it’s hard to track, an estimated 30-40% of produce grown worldwide is tossed for strictly cosmetic reasons (learn more about reducing food waste at home here). In Europe, Canada and Australia, grocery stores are starting to sell ugly produce at discounted rates. Now similar movements are afoot stateside. Check out these initiatives and give so-called ugly produce a chance. Introduced by food-services giant Compass Group USA and partner Bon Appétit Management Company in 2014, the program rescues “cosmetically challenged” produce that would have gone to waste. Imperfectly Delicious Produce supplies more than 200 commercial kitchens in 14 states and is expanding. To date, its chefs have cooked up more than 200,000 pounds of ugly produce. Doug Rauch, former president of Trader Joe’s, aims to bring healthy, inexpensive fare to areas that struggle with food insecurity, while also eliminating food waste, with Daily Table, his new nonprofit grocery store in the Dorchester neighborhood of Boston. An in-house chef transforms donated homely or surplus produce into grab-and-go meals that are just as easy—and inexpensive—as fast food, only far more nutritious. Co-founders Evan Lutz and John Zamora buy not-quite-retail-pretty goods from about 20 farms and wholesalers in the mid-Atlantic region and distribute to more than 600 CSA members in the Washington, D.C., area at a lower price than most CSAs. Hungry Harvest rescues roughly 20,000 pounds of produce monthly, and for every bag purchased by members it donates a healthy meal to a person in need.